Below banana layer cake was one of the cakes I made for my coffee invite event, which took place on March 3. Can I tell you a little secret? It is soooo good. 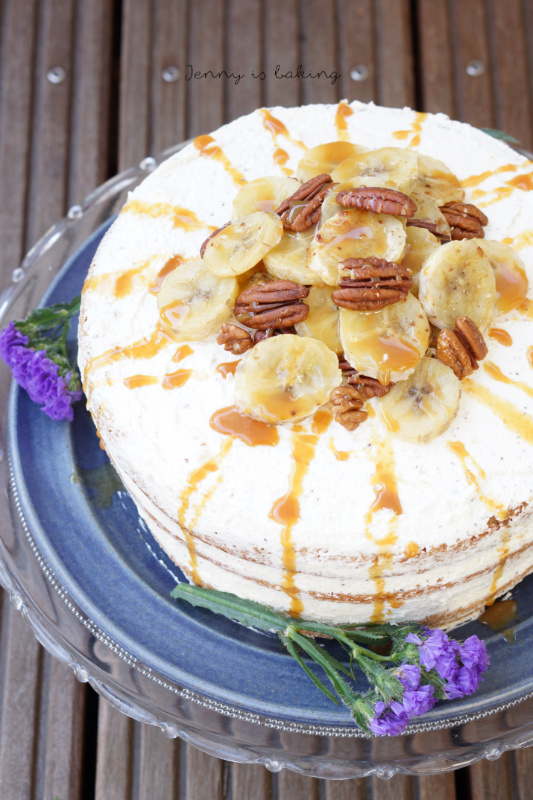 If you like bananas in a cake, this one is for you. My guests really loved it! 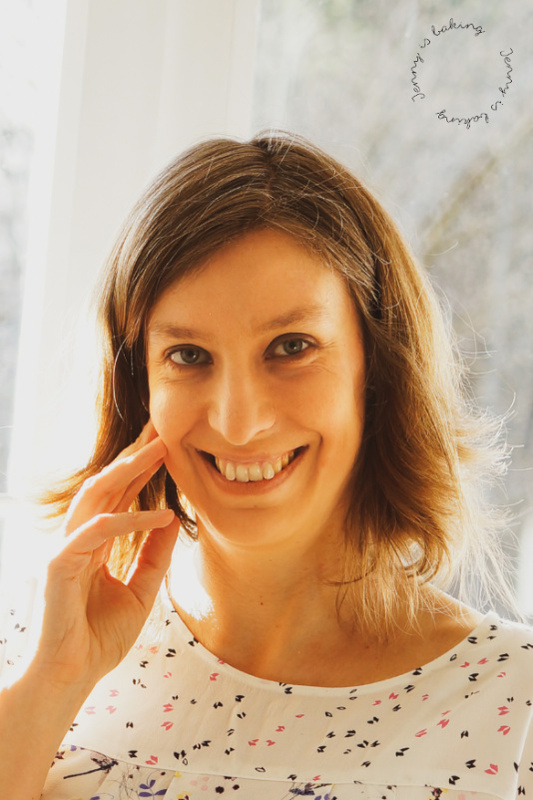 I am currently organizing a blog event in which you are very welcome to also take part. It will end on March 15 at 11:59pm CET. If you would like to learn more, read more here. But back to the cake. It is prepared rather quickly. If you happen to have three identical cake pans, congrats, you will be done in a jiffy. If you don’t, you have the option of either baking one cake after the next or you make one large cake you later cut into three layers. Since I am somebody who is really bad cutting anything properly, I went with the first option. And then let’s talk about the buttercream. I think, browning butter was a hype about five years ago. I know I am a little late to the game, but once I tried Italian buttercream for my homemade oreos, I was hooked and wanted to see whether it was possible to make that very same buttercream but with brown butter. Well, now I know you can and wow, is this frosting addicting! 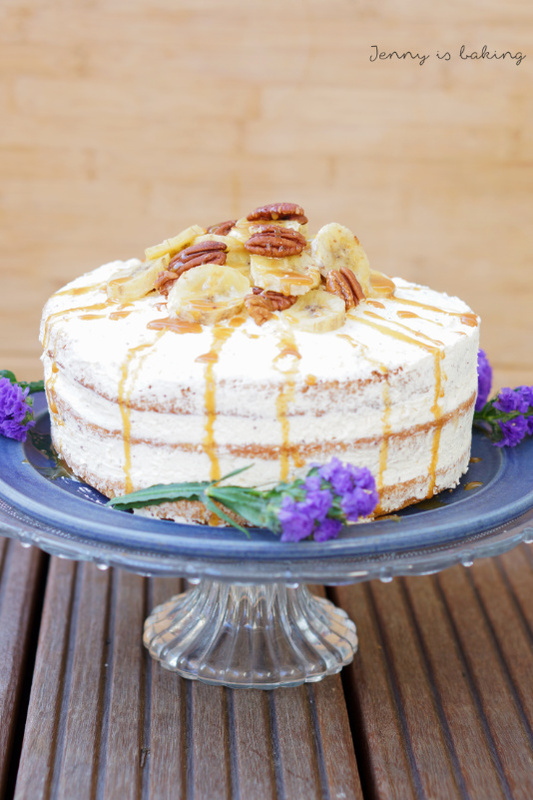 So let’s give the floor to this amazing banana layer cake with brown butter Italian buttercream! Make ahead tip: Brown the butter for the frosting first, see instructions below. 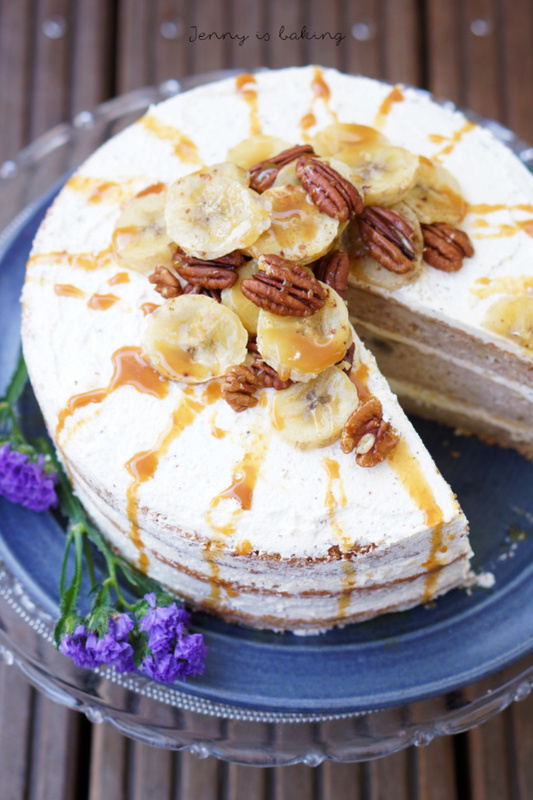 To make banana cake preheat oven to 180 degrees Celsius. Oil and lightly flour one or three springforms with 20-24 cm diameter. 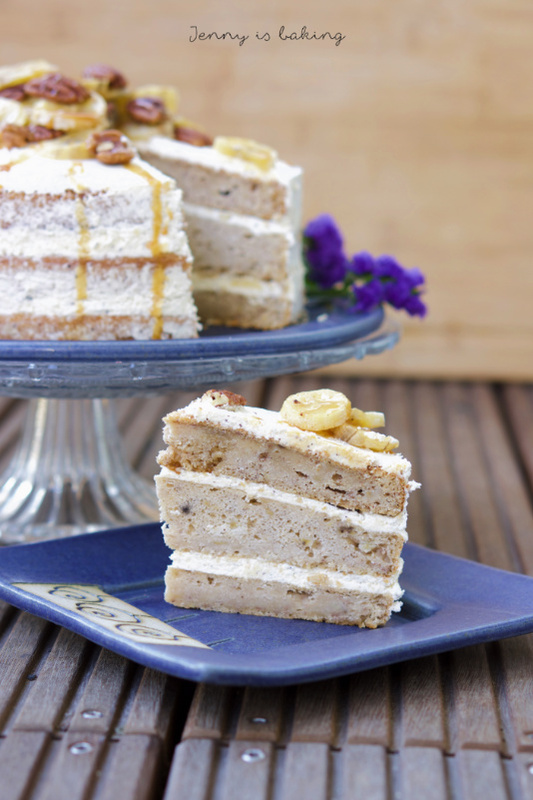 You will either need to bake one cake, which you divide into three parts later on or bake one layer after the next. Cream the butter with the sugars for about two minutes or until light and fluffy. Add eggs and vanilla extract, combine thoroughly. Add flour, baking powder, baking soda and cinnamon. While beating add the buttermilk slowly, only beat until everything is combined, don't overbeat. Pour 1/3 into each prepared springform. If you bake one after the next, be sure to chill the remaining batter. 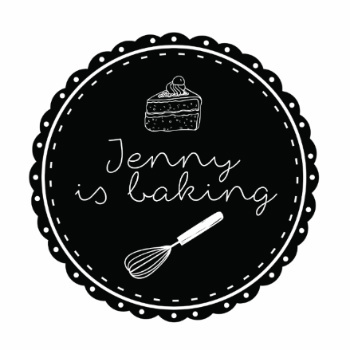 Bake for around 25min if baking one after the other or for about an hour if baking only one cake. Check your oven, an inserted toothpick should come out clean. Let cool in springform for a few minutes before taking out and letting cool completely. For the buttercream melt the butter on the stovetop, keep the temeprature at medium low and let bubble until the butter has an amber color and starts smelling like nuts. This normally takes at least five minutes. Immediately transfer to fridge to chill. After that boil 40 grams of sugar with water for about five minutes. Be sure to keep it at rather medium-high temperature. Meanwhile beat the egg whites until soft peaks form, gradually add 50 grams of sugar and beat on high until stiff peaks form. This usually takes in total about seven minutes. While still beating the egg whites on high, add the sugar sirup. Be careful while slowly adding the sirup to the egg whites. Continue beating until your bowl has room temperature again, this will at least take five more minutes. Once cool to the touch, add the brown butter slowly. I usually cut it up in five to six pieces and add one at a time. Don't be surprised if at some point the batter will look runny, this is normal, just continue beating until you have a smooth cream. To assemble the cake, put one layer of cake, smear on fourth of the buttercream on it, place the second layer on top, again buttercream, and then the third layer. Smear remaining buttercream on top and on the sides to get the "semi-naked" look, which is a crumb coat. Let chill. 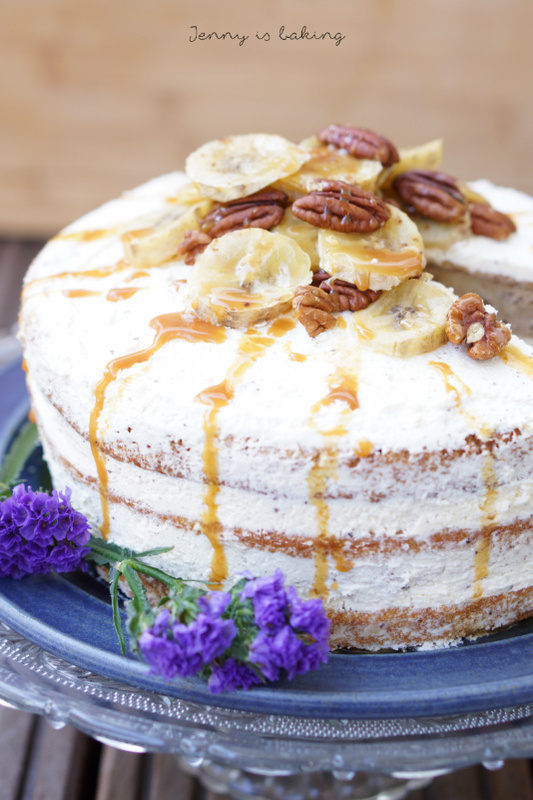 Decorate with pecans, banana chips or baked bananas brushed with lemon jucie and honey and caramel. I can only invite you to give this cake a try and to share it with somebody for your coffee invite. Don’t you think that would be a great idea? I think this is going to be my favorite cake ever! I love brown butter everything 😍 I had no idea it can be used to make Italian buttercream. Another of my favorites ❤ pecans and caramel too. I think I’ll be baking this one soon! Great recipe. Lizet, please let me know if you do!